I received a wonderful email from Sarah at Fabric Tragic the other day. Among some pretty nice things she said about my fabrics, she also asked, "Do you think your knits are suitable to fully construct with a sewing machine only or do you think a serger is essential for them?" I'm so glad you asked, Sarah! My very first mini venture into cutting and sewing sweater knit fabrics came many years ago. I used a common and easy method of creating a neckline. It's a technique that's used in industry. Many DIY machine knitters also use this method, as well as some hand knitters (who call it steeking). The neckline is simply cut with a good, sharp pair of scissors and then finished in a variety of ways. 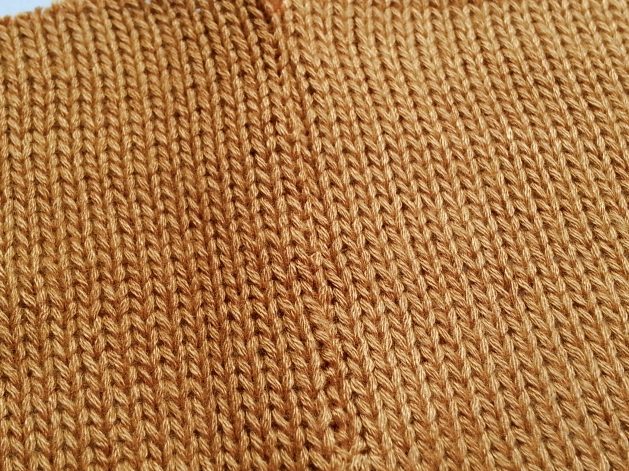 I can't speak for the hand knitters, but as many machine knitters do, I used a zigzag stitch on a sewing machine to stabilize the cut edge, before adding a binding to finish it off. It worked amazingly well. Before I got my serger, I did lots of research on how I was going to finish my cut and sew sweater knit garments. In the end I chose to use a serger because it sewed, trimmed, and finished in one step. But a serger is not essential; it's just faster. Below is my favorite way to sew, trim, and finish basic seams with a regular sewing machine. Step 1. Invest in a walking foot (ad link). Seriously. In the old days when I used cut and sew for necklines only, I hadn't even heard of a walking foot. If my neckline became stretched, I would try to snug it up with the binding and then steam-shrink it. But that only works well with wool. A walking foot is a marvelous accessory. It gives you a set of feed dogs on top of your fabric! 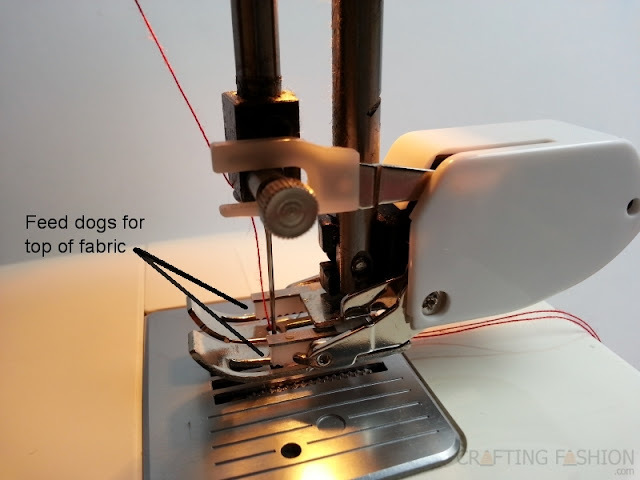 These, together with the regular feed dogs on your machine (underneath the fabric), feed the sweater knit fabric toward the needle very evenly. (That's why a walking foot is also known as an even feed foot.) If you've never used a walking foot before, this will rock your world! Be sure to get the right walking foot for your machine. It may be able to take a generic walking foot like the one above. Step 2. Zigzag the edges. Place the fabric under the walking foot so that all feed dogs make contact with the fabric. Step 3. Sew the seam. 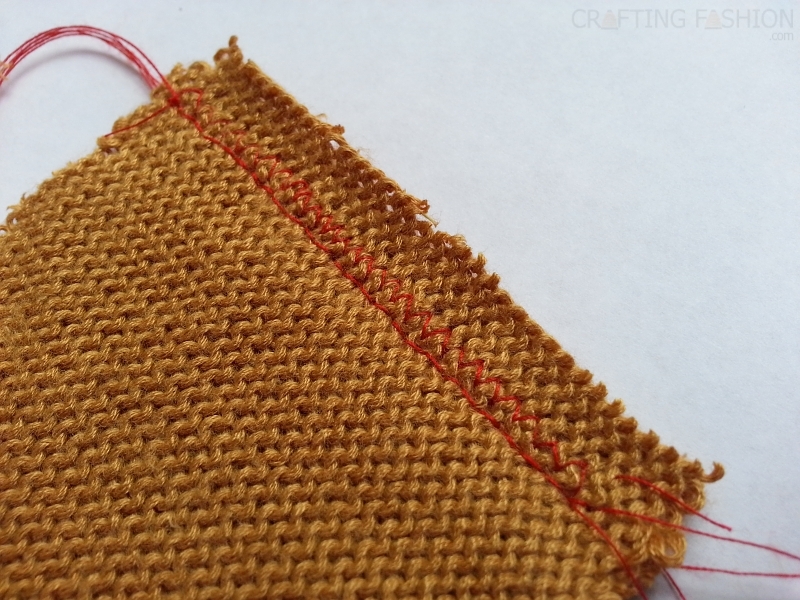 I used a wobble (narrow zigzag) stitch with the width at 0.75 mm and length at 3.5 mm. Seam allowance is 1/2 inch and stitched to the left of the zigzags. Step 4. Press seam flat and trim close to zigzag stitches. It will look like this on the public side. Practice on an old sweater first. 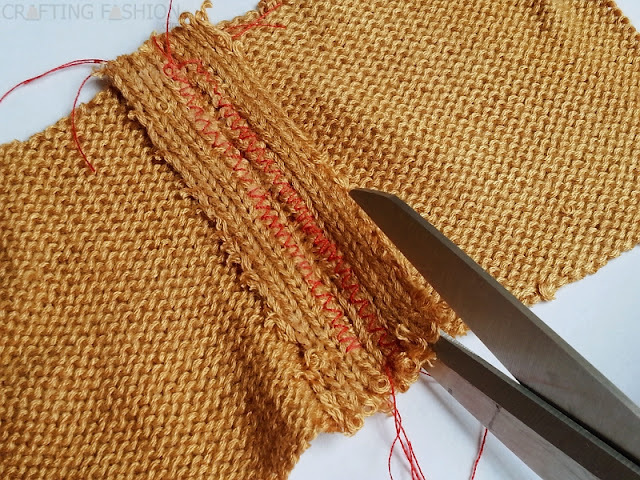 Then use the cutaways of the good material to get your stitch length and width just right for constructing the garment. Make your first project in wool. It's so much easier to work with than bamboo (pictured) or cotton. Wool isn't slippery and can stand up to a little abuse before fraying. Read Oh Baby! with Fabric.com: Sewing with Knits. While not specifically on sweater knit fabrics, it's loaded with good information and much, though not all, can be applied to the sweater knit fabric. I hope this helps, Sarah! Like sewing tips? Using a commercial sewing pattern for your sweater? Download Five Tips for Using Commercial Sewing Patterns with Sweater Knits. Hi, great article. Would machine sewing work with a bulky handknit sweater? I'm getting ready to assemble a large cardigan and I've never liked how I do sweater seams with yarn. As a sewist, it's very appealing to machine stitch my sweater together. Thanks. 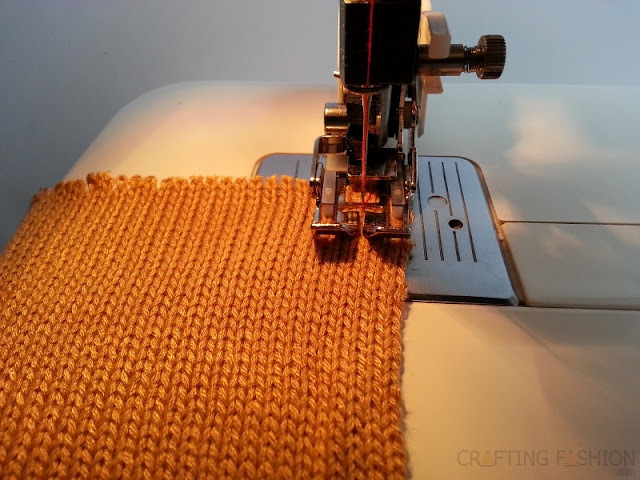 You probably wouldn't be attaching a cuff, but you can see pics of a heavy knit being used with a sewing machine with a good result. Please let me know how it turns out. I want to buy one of these machine. Can you set me up..!